Private Practice Attendings are heavily invested, both financially and emotionally, in the enterprise they worked so hard to create. They face unique challenges when it comes to safeguarding that practice in the event that one of the co-owners became too sick or injured to work. Preserving the continuity of the practice and retaining patients is important whether they eventually return to work or decide to sell the practice. Let us help you address the special needs of these individuals with our flexible, cost-effective business disability insurance (DI) offerings. We have the products and options for sole practitioners & partnership practices to protect their entity. The majority of practices have key physicians who are essential to the success of the practice. Whether these physicians are valuable because of their expertise, power, innovation or information, losing them (even temporarily) could be incredibly detrimental to a practice. Key Person Disability Insurance provides crucial benefits to protect the practice financially in the event that a key physician can no longer work due to a disability. Key Person coverage provides cash flow to help practices move forward and maintain a profit in the event that a key physician becomes disabled. In this situation, high limit disability insurance is invaluable. The practice could use the disability benefits to hire a temporary physician should the disabled physician’s prognosis appear to be a short-term disability. In the unfortunate circumstance of a permanent disability, benefits would then be used to help defray the costs related to hiring a replacement physician, such as recruitment, training, startup, loss in revenue and unfunded salary continuation costs. 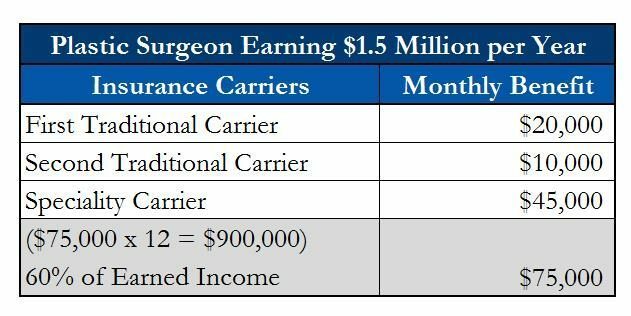 Most traditional carriers will retain maximum benefit amounts of $20,000 per month per policy, which may not be adequate for a higher earning specialist. In circumstances like these, we "layer" an additional $10,000 a month policy to increase the maximum to $30,000 per month with a tax free benefit. However, for those extremely high earners, we have formed relationships with specialty carriers who will insure 60% of any amount of earned income over and above the $30,000 per month from traditional carriers.